The Ridge Traverse is our speciality at Skye Guides but it should not be your first ambition in the Cuillin unless you are a highly competent mountaineer. The only exception to this is if you are incredibly fit and booking on a 1:1 basis. See suitability and vetting paragraph below. Our very high success rate totals more than 140 in number with an average of over 75 % of attempts started; 11 in 2013, 2014- 75% and 23 in total, 2015- 70% and 12 in total. This is only due to stringent vetting and following some rigid principles. Although a truly magnificent route, the Cuillin Ridge Traverse is a major alpine-style climb, a huge undertaking and is not for everyone. 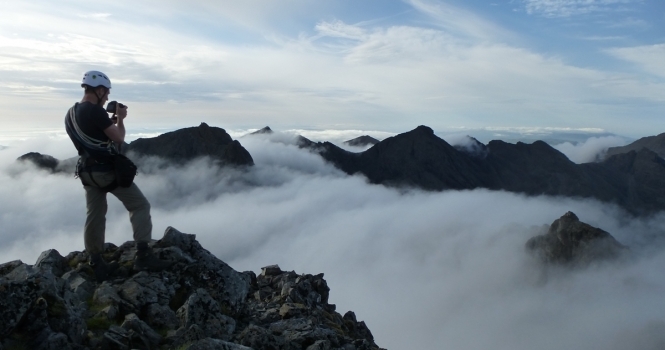 For a broad overview please read the Traverse information page and study the Free Download Tips for Success on the Cuillin Ridge . If this sounds like the challenge for you please Contact us by phone or e-mail to discuss. A very high level of fitness is paramount along with good core strength and balance. Previous experience in the Cuillin or on rocky ridges in the Alps is the best way to know if this challenge is for you and we are happy to advise. Like many aspects of mountaineering, the Traverse is fundamentally dangerous and our number one priority is to keep all members of the party safe. For this reason we vet all potential clients who enquire. * Refunds are for clients unfortunate enough to have no suitable weather window to justify an attempt in their 4 or 5-day course. ** 3-day courses are only available to clients with previous Cuillin experience and no refund is given if an attempt isn't feasible. How we charge for Traverses. 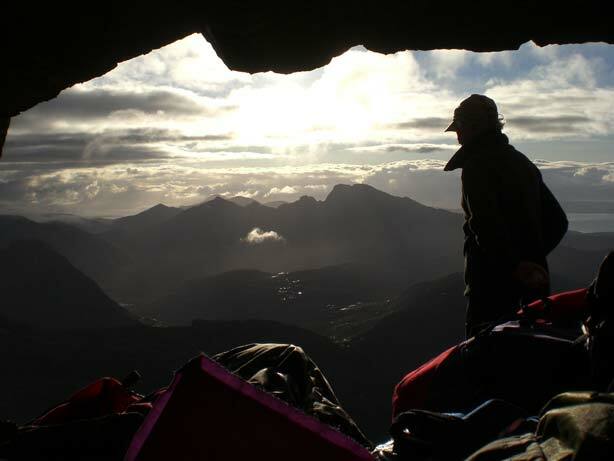 A Cuillin Ridge Traverse is a premium product and prices reflect this. However, the hourly rate for this product remains considerably lower than on all of our other courses. Justification for this anomaly is that, when conditions are suitable, our guides love the challenge of guiding the best alpine climb in Britain. If conditions aren’t suitable to make an attempt throughout your course less demanding outings will be made each day and compensation will be given in the form of a refund. This is the ultimate British mountaineering expedition and prices reflect the amount of effort from both client and guide to succeed. In addition to the climbing difficulties, logistics such as transport, food, water and bivvy equipment all need to be precisely organised. On average 32-36 hours are spent on the hill, equivalent to 4 individual day outings. 16-24 hours of this is climbing, scrambling & walking- compare this with an average of 10 hours spent climbing the Matterhorn and then add an uncomfortable night out. Single day attempts are possible for the supremely fit, highly experienced client in perfect weather but are charged at the same rate with other climbing done on the extra days available. We use our vast experience to advise on the best way to make the expedition successful but in some cases an attempt is not justifiable. Shorter but still classic outings are normally suitable so the days are all used. Dealing with this is complex but our policy is the fairest that we have come up with. The longer your stay the greater your chances of success so our recommendation is to book onto a 4 or 5-day course. This allows time for training, assessment and, most significantly, a suitable weather window. The success of the Traverse attempt is always the focus of the week. Careful consideration has to be given not only to the attempt but also nutrition, rest and the complex logistics of equipment and travel. The rest of the course is never wasted with time spent on a suitable mix of training climbs, scrambling and bivouac retrieval. Specifically the day following a successful Traverse is always low key. Day 1: Practice and assessment day. Approach Main Ridge by Thuilm Ridge of Mhadaidh. Stash water and bivvy gear. Day 4: Return to Elgol to retrieve vehicles. Possible sea cliff climbing. The 3-day booking is the minimum time commitment we request clients to make and is only for clients vetted as suitably fit and experienced. Its assumed that clients will be fully prepared and ready to set off as soon as weather premits. Only exceptionally fit clients, previously assessed by Skye Guides, are considered for this style of Cuillin Ridge Traverse. More commonly a weather window dictates a late evening approach, short rest/lightweight bivvy and a full Traverse the next day. Bivvying increases the chances of success for the majority of aspirants if done properly. You must still book a 3-day course but any extra any time will be spent climbing. All of our clients are all given a rating on suitability for a Traverse on normal daily outings. This is both for their interest and also to give future guides an idea of their ability. New clients aspiring to a Traverse should be able to demonstrate a very high level of fitness and relevant mountaineering experience. Previous experience of Cuillin peaks is often best as clients will know the scale of the undertaking. Alpine experience of ascents of rocky routes such as the Hornli Ridge (Matterhorn) or Mittelligi Ridge (Eiger), are suitable whereas an ascent of Mont Blanc is unlikely to have prepared you. Wide experience of trekking, overnight camping, general hill walking, rock climbing and alpine snow peaks are not often considered as suitable preparation. Chances of success are highest on a 1:1 basis. 1:2 is a safe and practical ratio if both clients are of equal fitness. For larger groups bespoke arrangements can be made. All party members should be of compatible fitness and ability. Harsh decisions often have to be made if this criteria is ignored.